We are very blessed in Texas to have so many types of habitat so close to each other. Where I live, three ecoregions come together, and within a 2-hour drive, there are 10 more. You can zoom in on this map to see the variety of ecosystems right around Houston. Because we have so much ecological diversity, and because we are on the Central Flyway for migration, we have a lot of birds here, both in number of species and numbers of individuals. 644 species have been recorded in Texas and my goal is to see them all! The concept of formal birding trails started in Texas in 1996. We have 15 just on the Upper Texas Coast (the north-east part of the coast, towards Louisiana). You can see those all here, and the one we chose for this weekend was the Bluewater Loop (although like a lot of the routes, this one is only a “loop” if you turn around and go back the way you came). Texas Parks and Wildlife Dept. 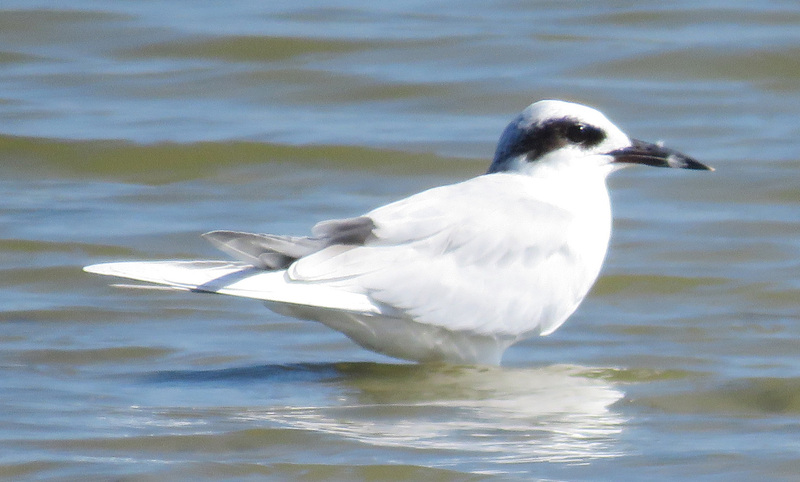 provides maps, but to really find all the little parking lots and kayak launch areas and nature centers, I rely on a book called Finding Birds on the Great Texas Coastal Birding Trail. It gives very specific directions, tells you what birds you are likely to see in a certain spot, and even lets you know where there are playgrounds and bait shops in case you are traveling with children or non-birders. 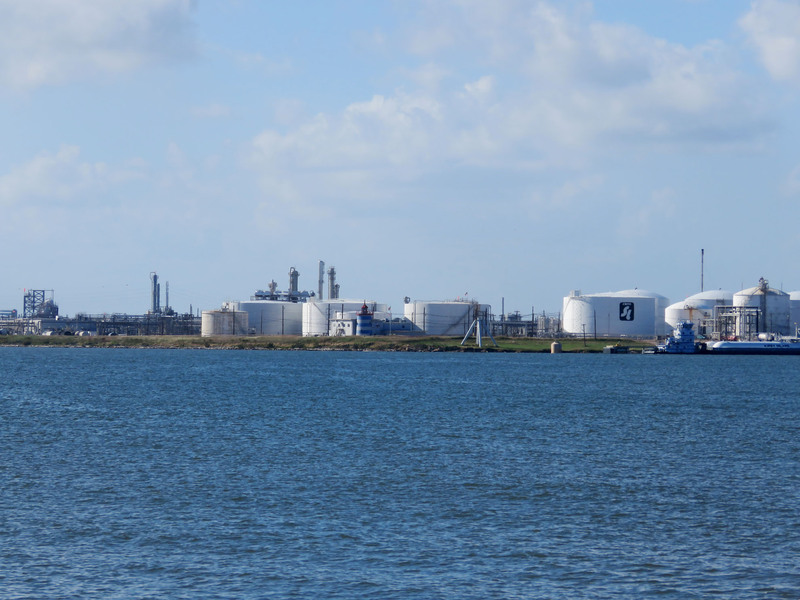 The Bluewater Loop is on Follets Island, which stretches along the coast, between the much more populated Galveston Island, and the very industrialized areas of Freeport. Some people may find driving through the docks and refineries to be the very opposite of their dreams of ideal birding spots, but I don’t find it off-putting. After all, some famous birding sites are garbage dumps and sewage treatment plants, so I don’t mind industrial sites. 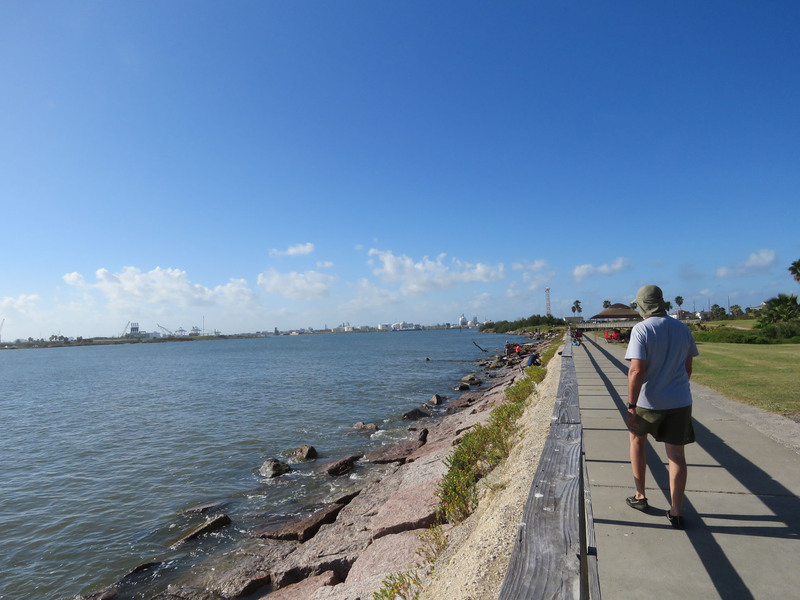 Walking down Surfside Jetty with an industrial complex on the horizon. Zooming in on the storage tanks. 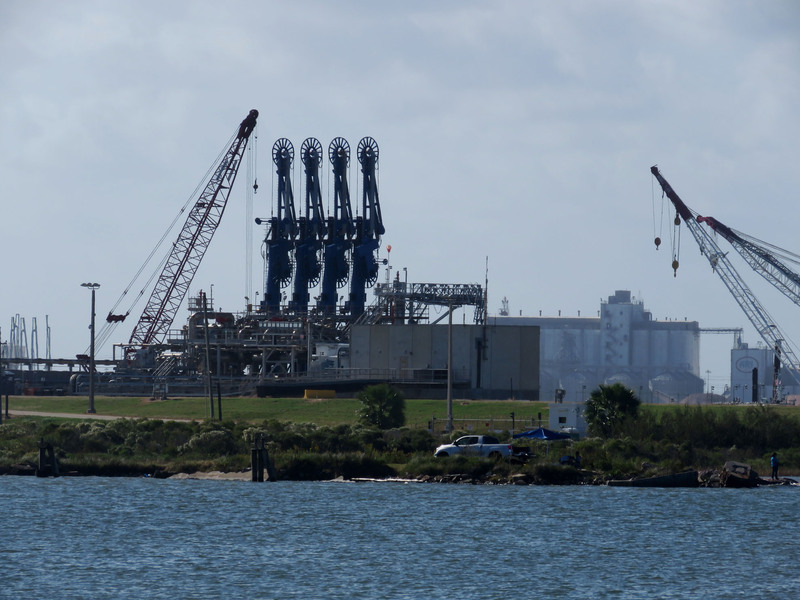 Cranes – the industrial kind, not the bird kind. Some of the companies have retention ponds and nature trails on their property, and are well-known places to spot certain species. (Once, on a guided birding tour, our bus was pulled off onto the roadside near one of these ponds. A policeman approached and we thought we were going to be sent on our way, but he just wanted to be sure we knew that Yellow-headed Blackbirds were at a pond further up the road.) And there are plenty of places that your view is open ocean. 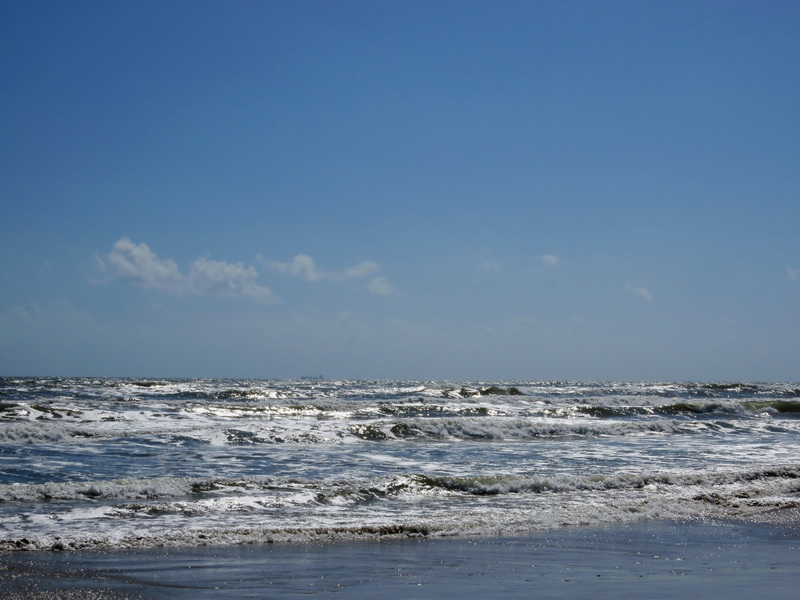 In contrast to the bay side, the Gulf’s pale sands sparkle just across the road…The Gulf’s beaches are a popular area for up to ten species of gulls and terns and several kinds of shorebirds. The beach flocks change with the seasons. Tri-colored Heron, perched on the fence of our first stop. 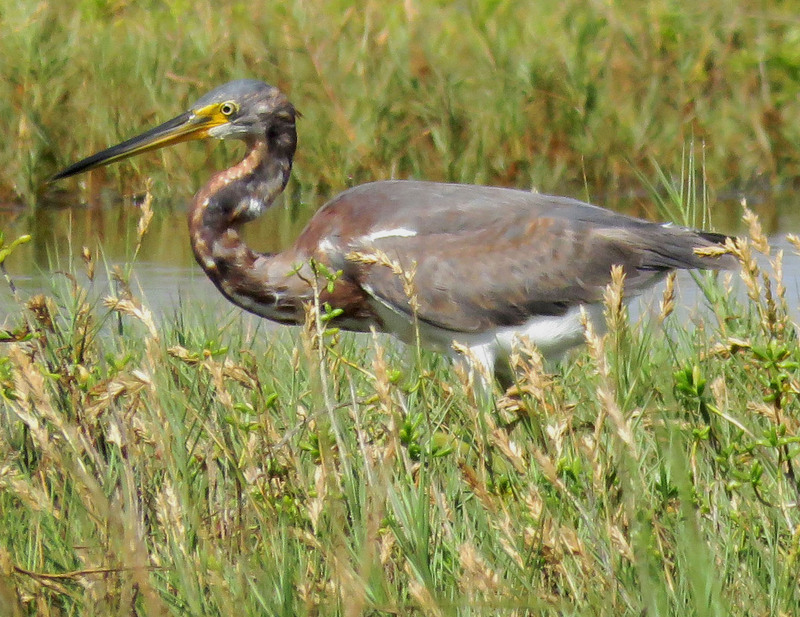 Another Tri-colored Heron, out in the marsh grasses. A Forster’s Tern. They look delicate until you see them plunge headfirst into the water after a fish. 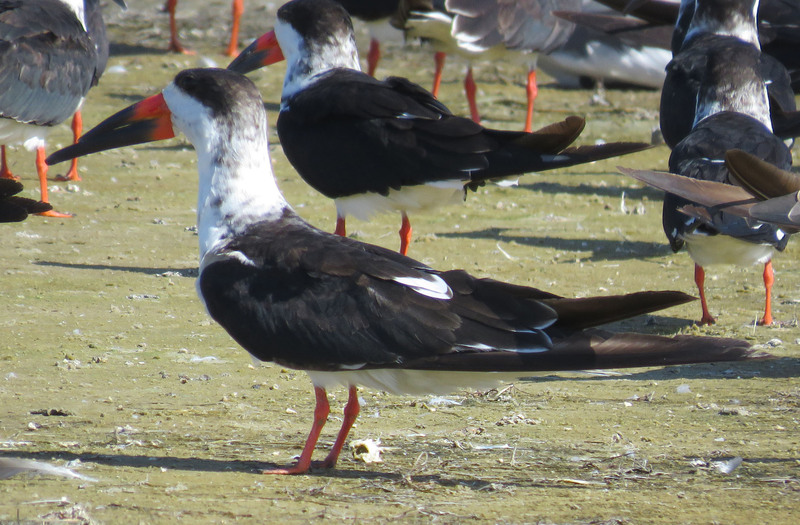 Black Skimmer. There is something about unbalanced, ungainly birds that I just love. Black Skimmers were there by the hundreds. A Snowy Egret posing by the waves. 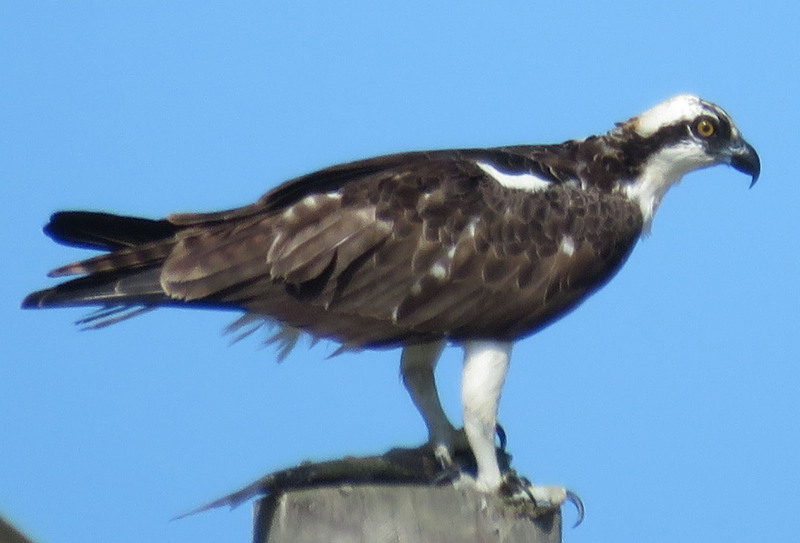 An Osprey with a fish, on top of a power pole. 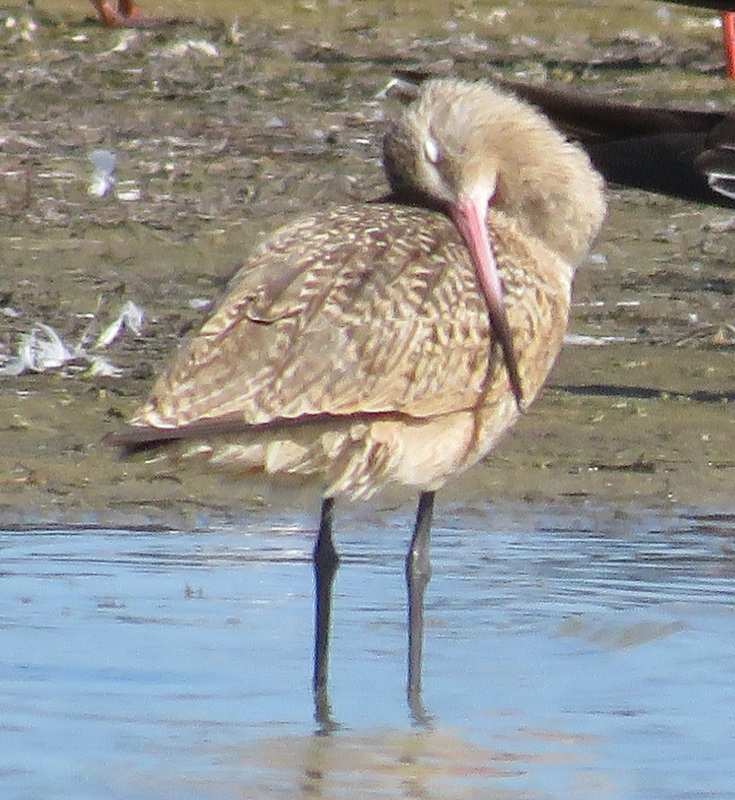 In the midst of all the bird ruckus, a Marbled Godwit catches a few winks. We ended up getting 38 bird species in about 5 hours. For some people, that is their weekly bird walk, but I was unfamiliar with some of the species and took a lot of time to study them and get lots of photos, to identify later. I really enjoy birding on the Texas Coast. There are people out and about everywhere you go, but they are relaxed and having a great time fishing or playing in the water. It’s so easy to find birds, you want to keep going and going. My only regret is that I didn’t even stop for a shrimp po’boy sandwich! Awesome photos! And I love the map tool. 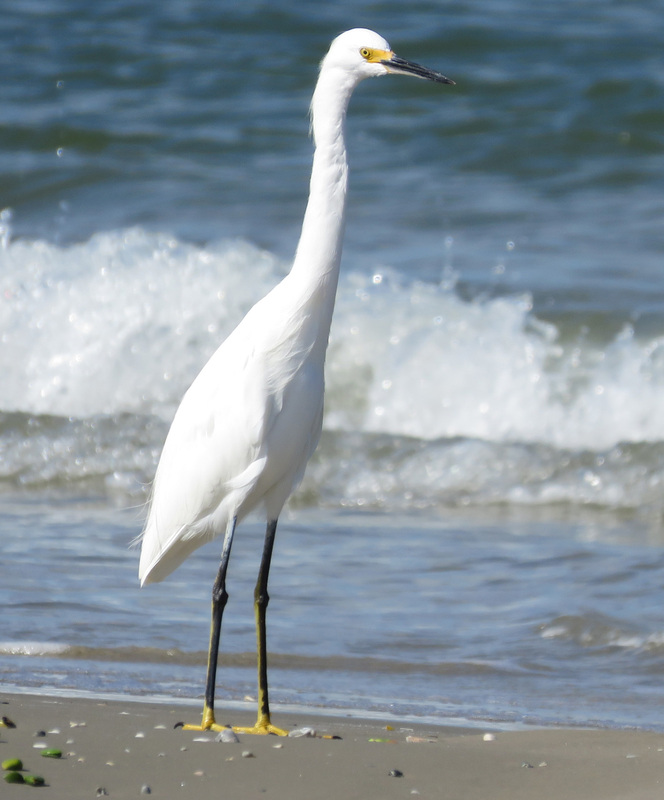 Snowy egrets are some of my favorites… I would see them on the coast of Florida all the time! Thanks! I see many of the other egrets and herons here on our farm which is about 80 miles inland from the coast, but I have never had a Snowy here, so I was glad to see one! Very nice photos. What camera setup were you using? We are in the Mississippi River fly way and enjoy a wide variety of passing birds. Isn’t it great being in a flyway? I love seeing the birds twice a year as they come and go. I have a Canon Powershot X60, which is a bridge camera, not a real DSLR, and I really don’t recommend it. It has a 65x optical zoom which is great, but I have had it almost two years and I just can’t get it to focus on what I want it to focus on! I had two similar cameras before and I never had this problem, so I don’t think it’s me or my inexperience. It may be that I have a setting wrong, but I have tried a lot of options and not solved the problem. I had much better luck with my Panasonic Lumix and I think I will go back to that next time. For my astrophotos, I set the focus to infinity and change some other specific settings. Those are saved in C1 and C2 locations. Thank you! I think I have tried all of that but I will go through it again. Especially because that online manual is much easier to read than the tiny print one. One thing that drives me crazy is how hard it is to use the joystick to set manual zoom, and then between shots it just defaults back to 10 ft., no matter that I just set it to 4 inches or whatever. The Panasonic was much more intuitive on setting manual focus. Also, when I do the half-press to focus, even on a tripod, I can see the camera jumping in and out of focus. Drives one crazy. Good luck. 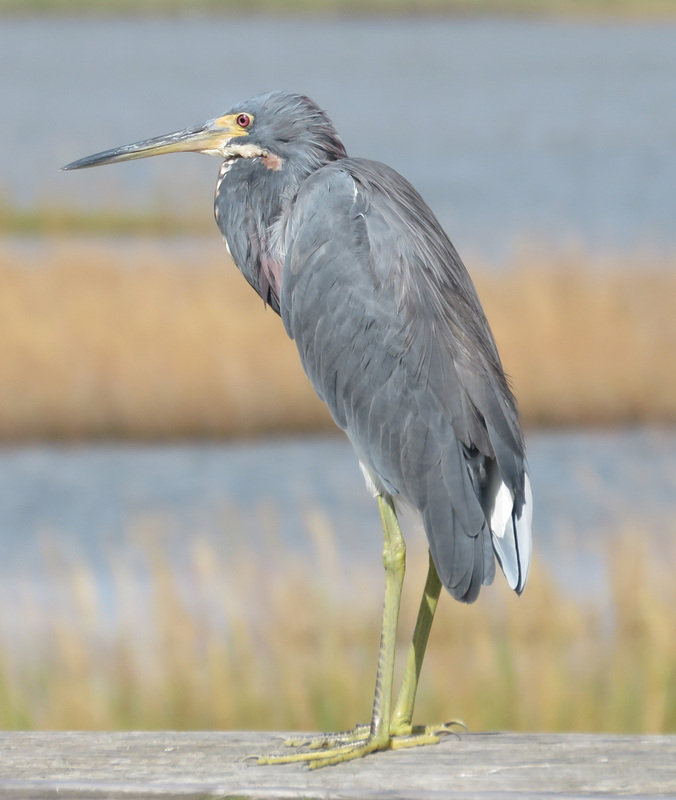 Loved your article – whenever we get to the coast, I love to watch all the birds. I agree your photos are great and yes these cameras can be a hassle at times. Possibly go to one of the larger camera shops and see if they can help. Curious…have you been to Bolivar Flats or the 27th street jetty on the other side of the ferry? 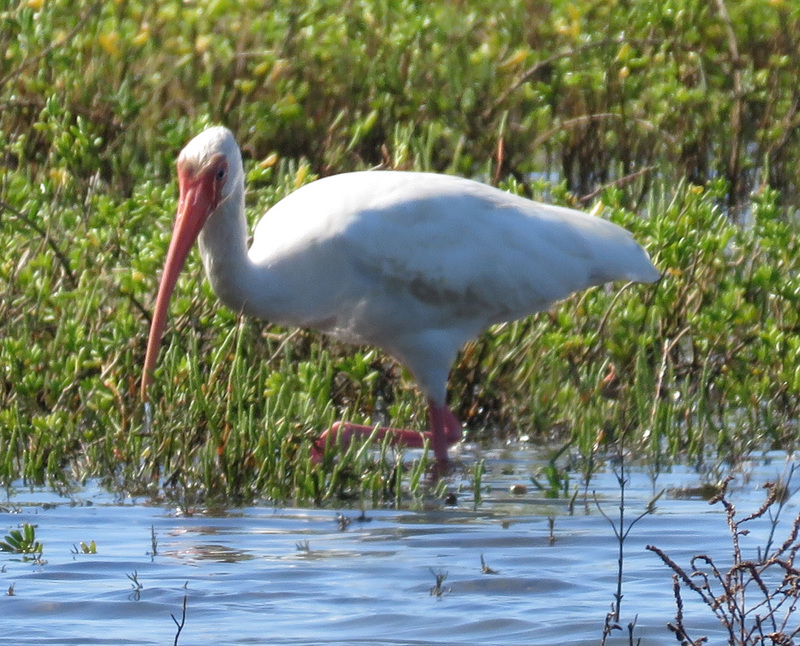 Some fantastic birding over there, especially at High Island and Galveston LaFitte’s during spring migration. It’s a veritable smorgasbord!! Yes, I too don’t mind the industrial. At least I can rest assure that the habitat will remain intact for a long period, not so with smaller private plots. I have been to Bolivar, but I’m not sure about the 17th St. jetty. I have gone on some birding trips with Harris County precinct 4 (or maybe 3? ), and they take us in a bus to all kinds of good locations, and help us ID what we’re seeing. I think the last time I went was in 2011. The trips were fun and I always intend to do them again, but then life gets busy.